System Builder, the Orbit Toy level editor. Around Christmas I released Orbit Toy, and while it achieved it’s goals it does have a problem. Simulating the solar system is all well and good, but Orbit Toy(and by extension Atomic Space Navy) is meant for fictional science as well as reality. Building a fictional star system of Orbit Toy is possible, I’ve done it, but it takes a lot of math and hand editing of text files. The time between putting new values into a file and seeing results is also long enough to make trial and error pretty rough. Luckily there exist ways to describe the shape of an orbit that are quite convenient. This past week I’ve been working on a sort of level editor for Orbit Toy called System Builder. 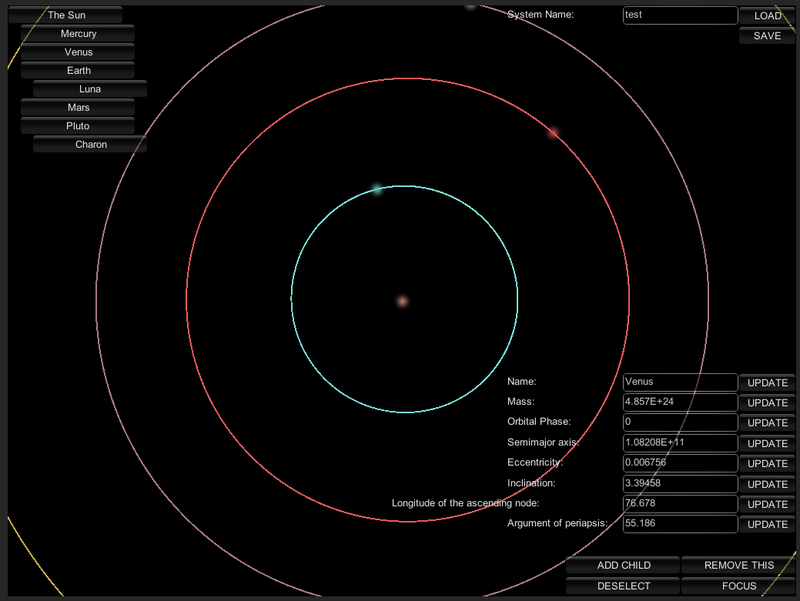 System Builder allows you to edit a star system in a graphical interface, seeing orbits change shape immediately, and then save the results in a format that Orbit Toy can read. System Builder is not a simulation. If your system is stable its display should be relatively accurate, but it not then all bets are off. If for example you make the earth heavier than the sun, System Builder will still assume that the earth, and all the other planets, will be orbiting the sun despite the fact that when you load that file into Orbit Toy at best everything will orbit the Earth, and more likely everything will be ejected from the solar system. The moon will still be given the right orbital velocity, but even then Orbit Toy’s simulation is unlikely to be able to handle an orbit that tight and fast. Future versions of Orbit Toy will at least come packaged with a copy of System Builder, and may actually incorporate it directly into the program. The initial version of System Builder will be available soon. The default system it comes with will include all the planets(you get Pluto as a bonus, and possibly the other four recognized dwarf planets too) and several of the major moons of the solar system. If anyone makes interesting systems and sends them to me, they may be included in future releases.